I was a sewing maniac back in the day,waaayyy back in the day. I had two sewing machines a serger and all the drafting tools that you would need to make anything. I was sewing and making money and then sewing became such a chore, I stopped all together, Boom! I was done. I made little things here and there but for my daughter and myself. Back in 2000 when we moved I was temped to give this away but I decided to keep it but it ended up in the garage on a shelf and uncovered. I misplaced the cover and thinking I would buy a new one, never covered it up. Since I have started sewing again I used binding and my pinking shears for my seams but thought one day I would take the serger out of the garage. My son was in the garage today and I decided to have him bring it in so that I could clean it. My oldest son who is 16 said "Mom that thing looks older than me." I said "it is older than you." I thought to myself as I was cleaning it, I have no ideal how to thread this thing, and when I opened the side panel the guide was there. I was relieved because I knew I was going to have the search youtube to see how to thread this thing. I put in a little elbow grease and oil and she's running like new. I am so impressed. That is a great job of cleaning/resuscitation! Can't wait to see what you produce with it. It was a little scary going in but I got it done, making a cover for this baby! Stay tuned!!! Yep! they ca take a licking and keep on...well you know the rest. Thanks for stopping by! Wow! What a great transformation! 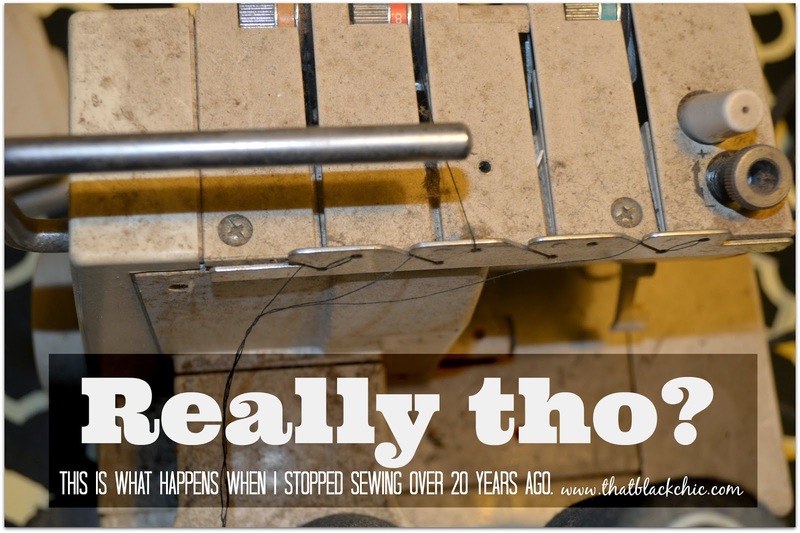 I have the 4 thread version of this serger that I am still using since I got it sometime in the late 80's. These machines don't die! LOL! Yeah you know that made those thing to last back then, not like some of the machines you buy today! Thanks for stopping by!